THE DRILL TIE STAKE® is a self-drilling metal rod capable of securing Turf Reinforcement Mats (TRM), Railroad Ties, and Landscape Timbers in place. 6”, 8”, 12, 18, 24” Special sizes can be ordered. A 2” washer is standard. 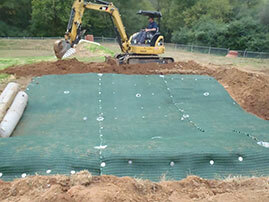 We have used different sizes at our customer’s request. 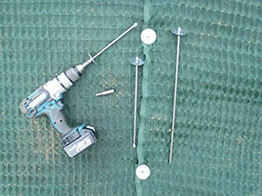 THE DRILL TIE STAKE® has been called “The Hybrid” in erosion control fastening systems.